Who make up Mud Rey? What other groups and musicians do you collaborate with? Ben Tufts: Mud Rey is Bobby Thompson, Tony Moreno and Ben Tufts. Through our semi-regular improvisational open mic that we host at Epicure Cafe, the Dirty Jam, we’ve brought together lots of musicians and groups to share the stage with us, including but certainly not limited to–members of Future, Colin Thompson Band, Stomp Status, Edy Blu, Lauren Calve Band, Candice Mills and the Infamous They, Analog State, Norman Rockwell and Moogatu. They’re all a part of the Mud Rey extended family. Where are you from originally and how long have you lived in the DC area? BenT: I was born in Falls Church and grew up in Sterling, VA. I went to schools in VA and MD, and I moved into DC a couple years ago. Bobby Thompson: I was born in Arlington VA, and I’ve lived here almost all my life, with the exception of 2 years in Los Angeles and a year in Kansas City. Tony Moreno: I am an army brat so I have spent a good portion of my life traveling around the world. I was born in Germany, lived in Korea, and most places in between. I have been living in Northern Virginia for over a decade now. Although I grew to appreciate traveling, it is really nice to have somewhere to call home. BenT: The original name for the band was The Dirty Santos–we wanted a title that was a bit tongue in cheek, but also expressed that we play loud and dirty, but at the end of the day we’re just nice boys who call our mothers every week. Unfortunately, we discovered somebody else was a little more clever than us, (or at least faster than we were), so we had to change the name. The sound of the name Mud Rey, to me at least, evokes the image of a manta ray, which have always looked a bit devilish to me, with their horn shaped fins, etc. Of course “Mud” keeps that whole “dirty” thing happening, and we changed the spelling because “rey” is Spanish for “king.” We don’t think we’re kings of anything, we just think it makes us sound sophisticated. Hopefully no one will find out the truth. BenT: Bobby and I jammed together once or twice a few years ago–he was looking to start a new original rock project, and we discovered we had some influences that overlapped–Led Zeppelin, Cream, the early Fleetwood Mac stuff with Peter Green, Jimi Hendrix, etc. I thought Tony would be a perfect fit–he and I had played together on a recording a couple years prior. The first rehearsal went pretty well, we got along great and the musical chemistry quickly escalated. Who did the behind the scenes work making the new EP sound great? BenT: We have engineer Aaron Mason from Sound Masonry Recording largely to thank for the quality of the sound on our EP. He tracked almost the entire record (a couple tracks were done with Sean Russell at Cue Recording Studios in Falls Church), and mixed the entire thing. I’m really particular, and mixing with me can be a LOT of back and forth. He’s very patient and attentive. He’s worked on a couple other recordings of mine that will be coming out later this year–the new Derek Evry EP, and the first EP from Lauren Calve. Both are already sounding fantastic. I see really good things for Aaron in the future, once people hear these records, they’re gonna be knocking down his door. What’s the scene like for blues music in DC? BobbyT: There are some quality venues in the DC area that express interest in blues music. Places like Gypsy Sally’s, Hill Country, and The Hamilton, to name a few, have been open to the current state of the blues here. We like to stretch the blues to its limits, so as far as a pure blues scene goes, we don’t really know how that’s sustaining itself. We think blues needs to be progressive to survive and attract a fresh audience, otherwise it feels like an old book in a library. We have a great appreciation and respect for the blues music that’s come before us. We want to play in a part it its survival so we write and perform with that in mind. Who are some of the most inspiring musicians you know in DC? BenT: As I put together this list in my head, I realize I’m really lucky in that I’ve been able to pull closer the people who really inspire me. I would say Andy Zipf is a guy who I look up to. I play in his new band, The Cowards Choir. Andy has been uncompromising in developing his sound. His songs are honest, and he works tirelessly to establish a bond with his audience, one member at a time. He’s a real genuine person, easy to work with. Honestly, Bobby is another one–he’s continually working on new material–his solo project is in the studio as I type this. I’ve had a few discussions with my friend Lauren Calve recently about the music community, what it is, and how it’s sustained. I really admire folks who work to bring people together in the scene. Derek Evry is one of those people. I respect hard work. My friends Chris and Erin in Miss Shevaughn and Yuma Wray, five hundred shows later, are still booking themselves, self-releasing the new album, and pushing forward. It’s a scary, scary thing to forsake nearly everything else in your life and dedicate all your time and energy to one thing–but when that thing is music, it’s downright crazy. I guess I admire people who are crazy enough to do that, too. BobbyT: I’m particularly inspired by great songwriters, and my two favorites happen to be two I’m honored to play with: Justin Jones and Laura Tsaggaris. TM: There are so many very talented and hard working musicians of various styles of music in the DC area. I feel blessed to part of a music scene that is so vibrant. From See-I to Funk Ark, Stomp Status to Colin Thompson Band, and Margot MacDonald to Luke Brindley, there really are too many mention. I am inspired to see other artist striving to express themselves through music in interesting and creative ways. It is not easy and it gives me strength to see others involved so passionately. 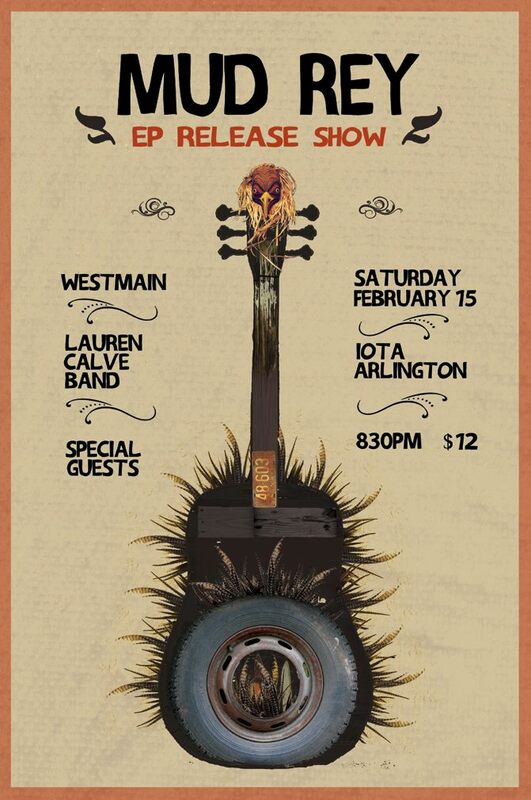 The release show for your new EP Lusi is Saturday February 15th. Who else is performing that night and what are the future plans for Mud Rey? BenT: We have a TON of folks joining us on stage Saturday–at last count, nine or ten guests! We’d like to keep that under wraps, although suffice to say many of them won’t be surprises. It’s a killer bill–we’re joined by Lauren Calve Band and westmain. I met a couple of the guys in westmain a year or two ago at one of the spots where I teach private lessons. They were so mild-mannered behind the desk, I had no idea what powerhouses they’d be on stage. It’s a really high energy rock show, very solid. I first heard Lauren about a year ago at IOTA open mic and immediately went up and introduced myself. She asked me to play in her band, and eventually on her new EP, which we’re just finishing up–it’s sounding fantastic already and I can’t wait for people to hear it. From your perspective as frequently gigging musicians, how has the business of music changed in the last few years? Where do you see things going both for musicians and consumers? BenT: This is always a tough question to answer without making things sound a bit dire. Gasoline gets more and more expensive every year, and people have largely stopped paying for recorded music. So the old paradigm of “get in the van and sell CDs at shows” has to change somehow, or the touring band will become extinct. Mud Rey has always been a “side project,” a labor of love for all three of us–we all have other things–other bands, family, etc.–that pull us away at times. That’s why it’s taken us so long to release the EP. But we’re really proud of it. There’s some talk of maybe doing a little bit of touring this summer, but we’ll have to see. I’ll be gone for nearly all of March, April and May on tour with Miss Shevaughn and Yuma Wray. You’ll be able to catch Bobby locally with his band, Justin Jones, Laura Tsaggaris, etc., and Tony plays in a number of groups, including Future and Projected Man. We’re staying busy. BobbyT: I think the challenge of the music business is right in front of us. If you work hard, not just at the business and networking side, but also at a top-notch performance level, then more doors open for you. People notice dedication and sincerity.